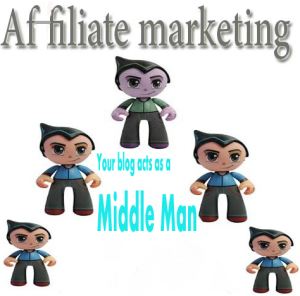 In my Affiliate Marketing for Blogs Guide,i will explain you what basically is Affiliate Marketing for Blogs and Websites and as a Beginner in Affiliate Network,what are the best resources or Best Affiliate Networks available through which you can make money from Blog or Website. Affiliate Marketing for Blogs,in a layman language,is purely a Commission based program,where you help to sell the product of a company by placing a banner on your Blog . Affiliate Marketing is considered to be money game between 3 Players and one network where all 3 player needs are fulfilled.The Retailer or Brand is able to sell the product,the Blog is rewarded with money for displaying its Banner Ad and the Customer get what he wants.Affiliate Marketing For Blogs has increased tremendously with the increasing Internet Power and is an effective way of earning Online Income for Bloggers apart from the usual Pay Per Click Advertising or CPM Advertising. Let’s clear it with n of Amazon.When you sign up for Amazon Affiliate Program,then they provide a code that is to be implemented on your blog and which shows a banner image regarding the product they want to sell in the market.Whenever a person visits to your site and he/she wants to buy a product which Amazon is selling and clicks on that link ,completes the transaction and purchase that product then you will be given the 10% money of the Purchased product.Just like Referral Marketing Companies do.You Blog is just like a middle man between the customers and Organisations. Running a variety of Affiliate Programs on blog with a bulk of traffic seems to be the common tactic nowadays through which you can easily make money from blog.And the most important thing about these is the quality product they sell to their customer and helps you to grab some dollars and even get some good thankful messages from your blog readers for the recommendation. Although,the Companies that provide Affiliate Programs widely varies according to your Blog Niche ,but here are some Best Affiliate Networks or Websites on which you can sign up and start earning some extra money. Hope you enjoyed reading this.You can Subscribe our Weekly Newsletter to get other Important Updates and Essential Tips to make Money From Blog.If you know any other Source that you might think be added in this post,kindly Share with us in our comments section Below.